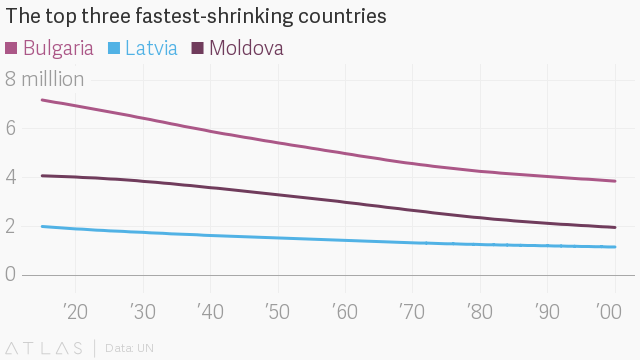 BBC Bulgaria is projected to have the fastest-shrinking population in the world. According to UN projections, Bulgaria is estimated to see its population shrink by 23% or more by 2050. A Eurostat survey concucted at the beginning of 2018 showed that there is a persistent trend of depopulation of rural areas and the relocation of people to the big cities in Bulgaria. Rural areas for about 65 years have lost nearly 6 million people at the expense of urban areas. Sofia and Varna are the only cities in the country marking an unchanged permanent increase in their population. In 1989, almost nine million people lived in Bulgaria. Now, it is a little over seven million. By 2050, that number is projected to be less than 5.5 million. Bulgarian villages have been losing people for decades. Reasons to leave the small villages are related to the lack of young people living there, which leads to the problem of not having someone to marry. Abandoned buildings are a common sight in parts of rural Bulgaria. Less and less young people are engaged in livestock farming, as it is heavy, not very well-paid, and in small villages, it is difficult to live when the population there is a two-digit number. Low birth rate - births for 2017 are 64,359, and by June 2018, just over 19,200 babies were born. On the other hand, only in 2017, NSI statistics indicated 109,791 deaths. According to Eurostat, Bulgaria has the highest mortality rates in the EU and is among the last regarding birth rate in 2017. Young people going abroad and never coming back because of the bad situation the country is in. Undoubtedly, many young people go abroad after finishing their secondary education as they consider that the opportunities offered by universities outside the country are better than the ones here. It is difficult to say how many Bulgarians have left Bulgaria - according to some statistics; they are about 1 million, according to others, around 2.5 million people. Anyway, their lack in the country is tangible. Employers experience a shortage of young people in the country. An increasing number of events are being organized to attract working Bulgarians from abroad with the hope of returning them to the country. The Bulgarian government even initiated a campaign to send letters to Bulgarians abroad calling for them to come back and live here. Most local employers also do not try to keep the few young workers left in the province. It is widely recognized that the interest is to "absorb" the funds allocated to the programs for unemployed youths, after which the employees are immediately released. Closure of factories, industrial facilities, and mines, forces people to look for work in other towns, or even outside the country. The government is introducing a number of measures to try to tackle depopulation by increasing the birth rate: offering help with the costs of fertility treatment, giving childcare, and mortgage support. Unfortunately, much more effort is needed not only by the government but also by the citizens. In order for a country to be a better place, only events, letters or requests are not enough but focused actions are needed, the results of which cannot come immediately, that is why the actions must be permanent.